Persistence Market Research (PMR) offers an 8-year forecast for global pharmacy benefit manager market between 2018 and 2026. In terms of value, the pharmacy benefit manager market is expected to register a steady growth rate during the forecast period. This study demonstrates the pharmacy benefit manager market dynamics and trends globally across seven regions: North America, Latin America, Europe, SEA & Other APAC, China, Japan, and the Middle East and Africa, which influence the current nature and future status of the pharmacy benefit manager market during the forecast period. This research report provides a detailed analysis of the pharmacy benefit manager market and offers insights about the various factors driving the popularity of pharmacy benefit manager and their features. The report includes an extensive analysis of key industry drivers, restraints, market trends, and market structure. The pharmacy benefit manager market study provides a comprehensive assessment of stakeholder strategies and imperatives for succeeding in the business. The report segregates the pharmacy benefit manager market based on services and demand determinants across different regions, globally. The pharmacy benefit manager market is expected to witness steady growth during the forecast period owing to the demand for pharmacy benefit managers offering innovative programs, such as disease and patient case management programs, advanced drug utilization programs, and pharmacy-medical integrated products have been the drivers for a number of emerging trends in the pharmacy benefit manager market. Pharmacy benefit managers are widely used by all tier companies to streamline the employee health and pharmacy benefits. Thus, pharmacy benefit managers are gaining importance in various commerce sectors. Growth in the global pharmacy benefit manager market is driven by demand for advanced prescription products, focus on reduction of drug cost, regulatory guidelines, and to better manage the member’s health conditions. Key regulatory requirements that drive the pharmacy benefit manager market are changes due to Medicare Part-D guidelines, healthcare reforms, and NCPDP regulations. The report starts with an overview of the pharmacy benefit manager market in terms of value. In addition, this section includes the analysis of key trends, drivers, and restraints from supply, demand, and economy, which are influencing the pharmacy benefit manager market. On the basis of service, specialty pharmacy services affiliated with pharmacy benefit managers are expected to register the most attractive growth during the forecast period. Based on the demand determinants, health insurance companies functioning as pharmacy benefit managers are expected to gain the highest market share penetration in the pharmacy benefit manager market during the forecast period. A detailed analysis has been provided for every segment in terms of market size analysis for the pharmacy benefit manager market across different regions. This section provides a detailed analysis that covers the key trends in the global pharmacy benefit manager market. The next section provides a detailed analysis of the pharmacy benefit manager market across various countries different regions. It provides a market outlook from 2018 to 2026 and sets the forecast within the context of the pharmacy benefit manager market, which includes latest technological developments as well as offerings in the market. This study discusses key trends within countries contributing to the growth of the pharmacy benefit manager market, as well as analyzes degree at which drivers are influencing the pharmacy benefit manager market in each region. 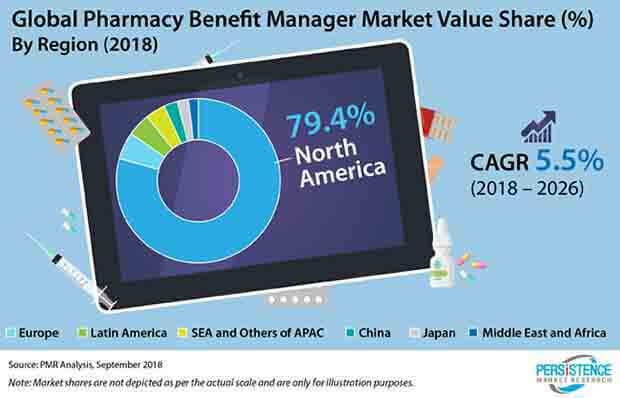 Key regions and countries assessed in this pharmacy benefit manager market report include North America, Latin America, Europe, SEA & Other APAC, China, Japan, and the Middle East and Africa. This pharmacy benefit manager market report evaluates the present scenario and the growth prospects of the pharmacy benefit manager market across various regions globally for the period 2018 – 2026. We have considered 2017 as the base year and provided data for the remaining 12 months. To offer an accurate forecast, we started by sizing the current market, which forms the basis of how the pharmacy benefit manager market will grow in the future. Given the characteristics of the pharmacy benefit manager market, we have triangulated the outcome of different types of analysis based on key pharmacy benefit manager market trends. As previously highlighted, the global pharmacy benefit manager market is split into different segments. All segments are analyzed in terms of the basis points system to understand the relative contribution of an individual segment to the growth of the pharmacy benefit manager market. This detailed information is important for the identification of various key trends in the global pharmacy benefit manager market. Another key feature of this report is the analysis of all key segments in terms of absolute dollar opportunity. This is traditionally overlooked while forecasting the market. However, absolute dollar opportunity is critical in assessing the level of opportunity that a pharmacy benefit manager company can look to achieve, as well as to identify potential resources from sales and delivery perspective in the global pharmacy benefit manager market. In the final section of the report, we include a competitive landscape to provide clients a dashboard view based on categories of providers in the value chain, their presence in pharmacy benefit manager portfolio, and key differentiators. This section is primarily designed to provide clients an objective and detailed comparative assessment of key providers specific to a market segment in the pharmacy benefit manager supply chain and potential players for the same. Pharmacy benefit manager market report audiences can gain segment-specific vendor insights to identify and evaluate key competitors in the pharmacy benefit manager market based on an in-depth assessment of capabilities and success in the pharmacy benefit manager market arena. Detailed profiles of providers are also included in the scope of the report to evaluate their long-term and short-term strategies, key offerings, and recent developments in the pharmacy benefit manager market. Key competitors covered in the pharmacy benefit manager market report are Express Scripts Holding Company; CVS Health Corporation; DST Systems, Inc.; Rite Aid Corp.; ProCare Rx. ; UnitedHealth Group; Benecard Services, LLC; BioScrip, Inc.; CaptureRx; and Change Healthcare. The global pharmacy benefit manager market is estimated to be valued at US$ 502,668.3 Mn by the end of the year 2020 and is expected to grow at a CAGR of 5.5% in terms of value over the forecast period. The global pharmacy benefit manager market is estimated to represent a considerable incremental opportunity between 2018 and 2028. On the basis of service offered by pharmacy benefit managers, the pharmacy benefit manager market is segmented into retail pharmacy services, specialty pharmacy services, benefit plan design and consultation, drug formulary management, and other services. Pharmacy benefit managers find applications in various commercial domains, and based on their demand determinants, the pharmacy benefit manager market is segmented into government health programs, employer-sponsored programs, health insurance companies, and other programs. Key regions and countries assessed in this pharmacy benefit manager market report include North America (U.S., Canada), Latin America (Brazil, Mexico, & Rest of Latin America), Europe (Germany, France, UK, Italy, Spain, Russia, & the rest of Europe), SEA & Other APAC (India, ASEAN, Australia and New Zealand, and the rest of SEA & Other APAC), China, Japan, and the Middle East and Africa (Northern Africa, GCC Countries, South Africa, Turkey, and the rest of Middle East and Africa). According to PMR analysis, the incorporation of the pharmacy benefit manager concept was practiced by large industries over a decade ago. With upgraded benefit plans and cost-effective solutions & services, pharmacy benefit managers have been adopted by small- and medium-sized enterprises as well. Pharmacy benefit managers are widely used by all tier companies to streamline the employee health and pharmacy benefits. Thus, pharmacy benefit managers are gaining importance in various commerce sectors. Growth in the global pharmacy benefit manager market is driven by demand for advanced prescription products, focus on reduction of drug cost, regulatory guidelines, and to better manage the member’s health conditions. Key regulatory requirements that drive the pharmacy benefit manager market are changes due to Medicare Part-D guidelines, healthcare reforms, and NCPDP regulations. Latin America is expected to register the highest growth rate. The pharmacy benefit manager market has a high potential in Latin America owing to government health programs and health insurance companies combining and utilizing various resources in the market to provide member-healthcare benefits. Thus, the pharmacy benefit manager market in Latin America region will be targeted the most by the pharmacy benefit manager market participants. The need to enhance the effectiveness and efficiency of chronic illness medications is expected to attract the attention of pharmacy benefit manager service providers towards the Latin America region. Pharmacy benefit managers in Latin America are currently focusing on launching pharmacy benefit management initiatives that offer proper scheduling and directions for efficient medication. The demand for innovative programs, such as disease and patient case management programs, advanced drug utilization programs, and pharmacy-medical integrated products have been the drivers for a number of emerging trends in the pharmacy benefit manager market. Additionally, the influence of social media networking is increasing rapidly in the pharmacy benefit manager arena. Almost all pharmacy benefit managers are responding to these drivers in similar yet distinct approaches. The pharmacy benefit manager market in North America holds the largest value share in the global market and is likely to maintain its dominance during the forecast period. The pharmacy benefit manager market in North America is estimated to hold the highest market share in the pharmacy benefit manager market, during the forecast period, due to the high adoption rate of pharmacy benefit manager services and solutions in the commercial sector. The ever-rising mortality and morbidity rates are motivating regional vendors to accelerate their pharmacy benefit manager businesses. Pharmacy benefit management companies are focusing on helping their clientele to manage their health condition more efficiently and effectively. Multiple programs are available in the North American pharmacy benefit manager market that strive to achieve this objective. Some of the market vendors in this study of the global pharmacy benefit manager market include Express Scripts Holding Company; CVS Health Corporation; DST Systems, Inc.; Rite Aid Corp.; ProCare Rx. ; UnitedHealth Group; Benecard Services, LLC; BioScrip, Inc.; CaptureRx; and Change Healthcare.